This 50 Games book is 85 pages of games using 50 tennis balls (included). Students are empowered to make their own activity choices at each station, creating an opportunity for students to participate at their own energy and ability levels. The toolkit is designed to help teach groups of children and adults about healthy eating and physical activity. The mat highlights all four fitness components – aerobic endurance, muscle strength, muscle endurance, and flexibility. This great resource is available for three different age groups: 1 to 4 years, 5 to 11 years and 13 to 18 years. Create a high energy session with skipping and popping! 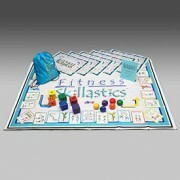 This kit includes four physical activity modules with different weekly themes. 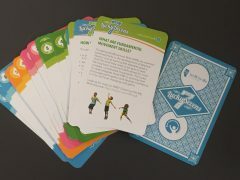 The Be Fit For Life Network has teamed up with Ever Active Schools and the AMA Youth Run Club to create this card game. Lesson plans for cross curricular activities relating to pedometers. This package includes a class set of pedometer, instruction card and information pertaining to pedometer use. 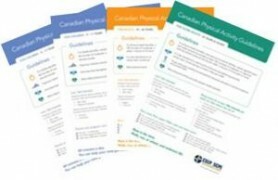 Canadian Society for Exercise Physiologists has Physical Activity and Sedentary Behaviours Guidelines for Canadians. An important component of a Quality Daily Physical Education program is assessing the program and evaluating how well it is supporting the development of physical literacy. 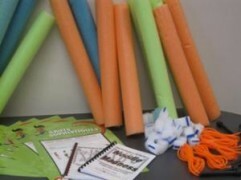 Resistance bands are an inexpensive, versatile tool for active learning opportunities in the classroom or gym. This package includes a class set of rubber chickens accompanied by a resource book that includes a multitude of ‘Zany’ rubber chicken activities that are great for all ages! Speed stacking helps students develop bilateral proficiency equal performance on both sides of the brain. 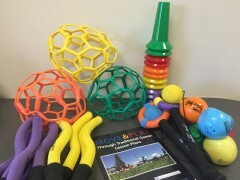 Utilizing active games, link traditional culture and values to physical literacy and fundamental movement skills. Yoga Techniques for the Classroom is a great resource for indoor DPA.